The Postal Stationery Society welcomes you to our website. Please use the menu to the left to navigate. If you are not already a member and you collect postal stationery, no matter what country or area of interest, we recommend you to become a member of the Postal Stationery Society. Complete the Application Form to join today. Subscriptions for 2019 are now due. If you have not already paid your subs for the year do not delay payment. Details of how to pay are to be found on the renewal notice sent by post or on the Subscriptions page of this website. At the meeting room in the Royal Philatelic Society, 41 Devonshire Place, London W1G 6JY. 10.30 am Meet for coffee. This display will be followed by the Society's One Sheet Competition, with all members present being asked to vote for their choice of winner. 12.30 pm Lunch. We will arrange to eat in one of the restaurants close by, and all members are invited to join in. The cost should be no more than about £17 each, including wine. 2.00 pm The session after lunch will be for members' displays. Members are asked to bring along a maximum of 32 sheets on a postal stationery theme, and to give a display lasting not more that 10 minutes with a further 10 minutes for viewing. The meeting will finish at approximately 4.00pm. This will be the last meeting at Devonshire Place and the October meeting and auction will take place at the Royal's new premises in Abchurch Lane. A Postal Auction will take place on Monday 29 April 2019. For more details and to download a catalogue go to the Auction page of this website. Members will have been aware that Colin had not been in the best of health since the beginning of the year, and it is with the greatest regret that I have to announce that Colin passed away on Friday the 21st of July. Colin was a Founder member of the Postal Stationery Society when it was formed in 1992. He became Society Secretary in 1999 and served in that position until failing health prevented him from continuing, his display of East African postal stationery, which he was due to give at the March 2017 meeting, being presented on his behalf by Michael Smith. Colin was born in Bromley on the 6th of March 1942, went to school locally, and went on to become a Chartered Civil Engineer, spending five years building roads in East Africa, where his childhood interest in stamp collecting was rekindled having been initially stimulated by his father who was a passionate collector. Colin was both an enthusiastic and knowledgeable philatelist, always willing to lend his administrative skills to assist with the operation of the organisations of which he was a member. Thus he has served as Secretary to the Basingstoke and Warminster Philatelic Societies and the Wiltshire federation, as Auctioneer to the G.B. Overprints Society and also was a Past Chairman of a number of Societies. He was also a member of the Great Britain Philatelic Society, the Royal Philatelic Society London, the Society of Postal Historians and the East Africa Study Circle. A strong supporter of the Bath Postal Museum, he edited their Journal ‘Posted’ and served as a Trustee. Colin played a major role in the relocation of the Museum when it moved to new premises. Colin's interest in postal stationery started about forty five years ago on his return to the UK and he built up a significant collection of British and East African material which he readily displayed. Colin also wrote extensively about postal stationery both in Society and National publications including the Philatelic Bulletin. From 1999 to 2004 the PSS published the following monographs by Colin - Great Britain Victorian Private Stationery Impressed with Embossed Stamps; Great Britain: the Mulready Postal Stationery; The Real Cost of the Penny Post; The Development of the Aerogramme; The Jubilee of the Uniform Penny Post and Great Britain Postage Rates Prepaid by Postal stationery 1840-2004. Colin was also co-author with myself of Collect British Postal Stationery published jointly by the Great Britain Philatelic Society and the Postal Stationery Society in 2008, and we were working on a successor to this right up until his illness. There is no doubt that Colin made a notable contribution to the hobby and a number of organisations will find it difficult to replace the input he gave so freely. In recognition of his involvement in philately Colin received the Association of British Philatelic Societies Award of Merit in 2010. On a personal note, and I am sure others will feel the same, I will greatly miss his friendship and enthusiastic co-operation in all we did together. Finally on behalf of the Society membership I would like to extend our very sincere condolences to Christine and his sons Duncan and Simon. With the untimely death, on 1 March 2017, of lain Stevenson, aged 66, in a road traffic accident, philately has lost one of its more unusual characters. Iain's philatelic interests were many and varied and his presence will be missed by members of a number of Societies. Besides postal stationery he also had collections of telegraph stamps and forms, Belgium, Canadian Pacific Railway postcards, Canadian revenues and Lanarkshire postal history. An exhibitor at both National and International level, Iain was also an accredited Juror serving at both National and International levels. Iain was the consummate collector espousing many interests besides philately, including tinplate toys, printed ephemera and English drinking glasses, the last reflecting his connoisseurship of wine. He joined the Royal Philatelic Society London in 1990, was elected to Fellowship in 1999 and served on the Council from 1998 to 2006. He gave a memorable ‘One O'clock display’ on ‘The Telegraph Stamps and Stationery of the World’ in April 2005 and stood in at the last minute to give the 2015 Sir Daniel Cooper Lecture entitled ‘The Telegraph Stamps of Great Britain’. Iain joined The Postal Stationery Society in 1993. At university Iain studied geography and became a Fellow of the Royal Geographical Society. His professional career spanned publishing both commercially and at the Stationery Office and finally the academic world, where he spent a number of years at City University and University College London, retiring in 2015 from the latter as Emeritus Professor of Publishing. Iain was an enthusiastic and entertaining speaker who wrote widely on both professional and philatelic subjects, and all those who have had the pleasure of his company and the benefit of his advice and knowledge will greatly miss his presence. 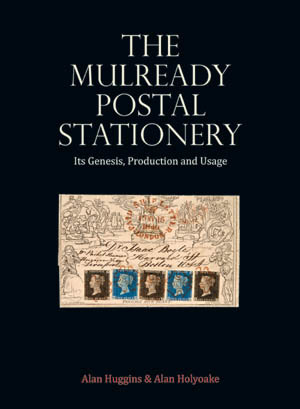 This new book on the Mulready postal stationery will be available from the Postal Stationery Society from 10th December 2015. The price is £40 plus postage (£36 to PSS members) Postage is inland £3.00, to Europe £8.00 and to the rest of the world £10.00. If you would like a copy of this book, please contact Neil Sargent, the Secretary of the Postal Stationery Society. You can email him at .